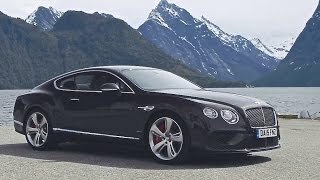 Soon after a year of the first GT Speed update, the luxury car maker Bentley introduced the Bentley Continental GT Speed 2016 at the Geneva Motor Show 2015 . Scheduled to be out as production version by 2016 this revised model is expected to make new milestones. 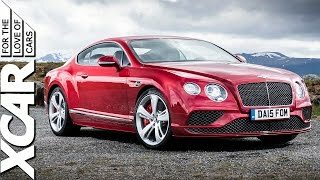 Let us have a look at the grounds on which company is anticipating the success of model, through the review of Bentley Continental GT Speed 2016. The interior of Bentley Continental GT Speed 2016 might not have intense upgrades but those integrated in it, are easily noticeable and take the model a lap ahead. Behind the three-spoke steering wheel is the revised instrument panel featuring new dials and graphics. The driver controls mounted on dash also get a crunchy look making the cabin look better. Keeping the queue moving, we’ll have revised center console which now comes with a black gear-lever amidst the LED ambient lighting surrounding the cabin. Apart from these standard changes, buyers will also get host of new options to make their car look bit personalized. The series of options include, color-matching Alcantara and softer semi-aniline hide. The interior of Bentley Continental GT Speed 2016 in total gets the blend of 17 different shades in its list of options, giving you a wide range to choose the more personalized car that suits your mood. The exterior of Bentley Continental GT Speed 2016 takes the predecessor’s aerodynamic changes bit ahead and bring in a revised bumper and modified grille. Starting with the front fascia you’ll have a new grille with a vertical slim line in center. The setup sits amidst the circular pair of headlights. The front apron gets bold with the newly designed intakes while the bumper gets a massive center vent at the center making the overall front look more aggressive. Moving towards the rear end, there is a muscular trunk lid with integrated redesigned spoiler. Beneath it there is new diffuser with a chrome strip running all across the length of bumper. 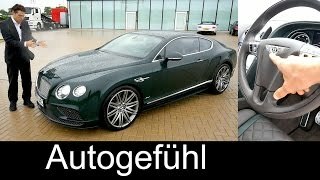 In all rounding up the exterior details of Bentley Continental GT Speed 2016 I would say, it classy, bold and aggressive. Beneath the hood of Bentley Continental GT Speed 2016 is the powerful 6.0 Liter twin-turbo W12 engine cranking total output of 626 hp and peak torque of 823 nm paired to ZF eight-speed automatic transmission with Quickshift, Block Shifting and wheel-mounted paddle shift. With this power rolling the massive 21” wheels of the model, the top speed of Bentley Continental GT Speed 2016 touches the mark of 206 mph while the 0-60 mph sprint can be knocked in just 4.0 seconds.